Let’s face it, investors and traders love selling volatility. Ever since volatility essentially become its own asset class, the investing world has loved to be short it. After all, selling volatility works out the vast majority of the time. However, the problem with being short volatility is that it can reverse in a hurry. When market volatility goes up, it tends to go up very fast. That obviously can pose a huge problem for short volatility traders, who may not have time to hedge or cover their losing trades. Of course, seasoned traders tend to build in contingencies and hedges into their trading plan. Basically, it’s never a good idea to be naked short market volatility. In any asset class, volatility can turn on a dime. This past week, it looked like volatility – as measured by the VIX – was headed to the doldrums akin to 2017. The VIX was down to about 13 after slowly moving down for the past several weeks. And then, seemingly out of nowhere, the market tanked on Friday and the VIX shot up to 17. Friday’s action is why being short volatility can be very dangerous. It’s also why any short volatility position should be hedged. There’s no point in selling volatility regularly if you’re going to give up your gains all in one day. So how did the options market respond to the spike in VIX? Well, there were certainly plenty of reactionary trades, but there were also a number of big traders who weren’t convinced this selloff was going to stick. 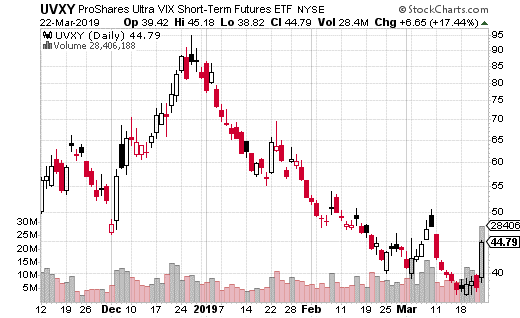 Several block trades in both iPath Series B S&P 500 VIX Short-term Futures ETN (AMEX: VXXB) and ProShares Ultra VIX Short-term Futures ETF (NYSE: UVXY) suggest volatility will be coming back down soon. 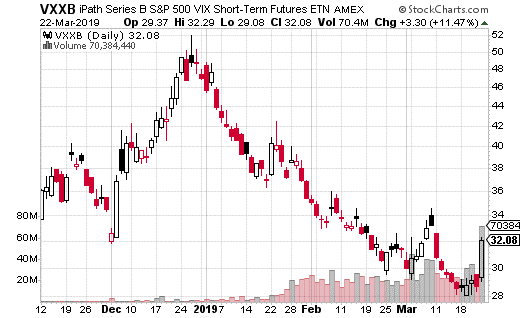 VXXB and UVXY are exchange traded products which both track short-term VIX futures. They are the easiest and most popular way to trade short-term volatility. The only difference between the two is UVXY is leveraged 1.5x, so it moves a bit faster than VXXB. Options traders made large bets in both VXXB and UVXY on volatility coming back down in the next two weeks. In UVXY, a large buyer purchased 3,000 April 5th 41 puts for $3. That’s a $900,000 bet that UVXY gets down to at least $38 by April 5th expiration (it closed last Friday at about $45). Meanwhile, a large trader took a different approach in VXXB by selling calls instead of buying puts. The trader sold 5,000 April 5th 34 calls for $0.75. The stock closed the day at $32. As long as VXXB is below $34 on April expiration, the trade generates $375,000 in premium collected. The VXXB trade is a much higher probability trade, but is also higher risk (should volatility keep going up). The UVXY trade is very expensive and has a lower probability of success but the risk is defined. I would probably take a piece from each trade and instead buy puts on VXXB. For instance, let’s stick with the idea that April 5th is as long as we want to go out on any bearish volatility trades. You can get the VXXB 30 put for about $0.75 with the stock at $32. Getting down to the breakeven of $29.25 is very much an achievable goal if this current VIX spike is short-lived. Plus, you know exactly what your risk is on this trade.